- Everything is ready 10th Master said Interrogator Chaplain Javert. - Well done Javert, I assume everything is being taken care of? Captain Semper replied with an impassive voice. - Shall I give orders to the Ship Master to bring the Lion’s Wrath about? - No need for that Javert! The stern voice was of that of the Shadow Guard, Grand Master of the Inner Circle. - But are we going to be on time my lord? Don’t we need to travel far? Welcome to the fifth consecutive ETL – The Shadow Guard Edition! This year we celebrate half a decade of continuous presence during which this event has grown and adapted to the realities of the hobby and the changes of B&C structure. When it started back in 2012 it certainly was with a bang: a good 290 frater embraced it immediately making it the most popular event ever ran in the B&C. But it did not stop there. The participation grew year by year to reach almost 500 in its fourth incarnation. The Shadow Guard has been my steadfast partner in this huge project from day one (back in the concept stages) providing the characteristic imagery of the ETL, the multitudes of badges and banners and always, always being there to support or shoot down ideas that come into my head well before they see the light of day (or being buried in the depths of the Rock for ever). So for putting-up with a temperamental, mood-swinging and oftentimes explosive Captain Semper all these years and still maintaining his commitment and enthusiasm despite the heavy toll real life has instore for all of us, this ETL is dedicated to The Shadow Guard! 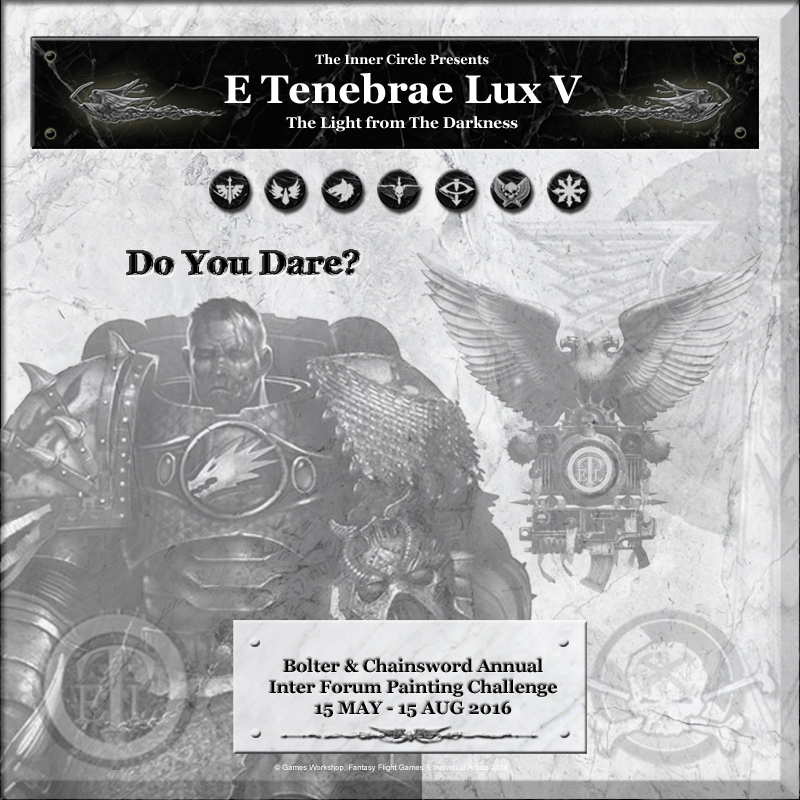 E TENEBRAE LUX (ETL) is an open-for-all event that aims to motivate the frater to build-up their armies in solid blocks while cultivating member interaction within individual forums as well as on a cross-forum level. ETL is designed to play down the inherent disadvantage of low traffic of some forums, levelling out as much as possible the chance of victory for all. The challenge is to paint legal units for your preferred army over a three-month period to the best of your ability. The reward is twofold: a personal and a collective one. On a personal level everyone who completes his/her vows will receive the “Custos Fidei”, the ETL badge of honour – a glorious distinction as veterans of previous ETLs will testify. On a collective level, the faction that cumulatively has the most points painted (as per relevant Codices and army lists) wins and becomes “Primus Inter Pares” i.e. the ETL Champion! In the first ETL the Black Templars emerged victorious totalling 45k pts, in the second ETL, the Dark Angels took their revenge totalling 58k pts while last two years it was Chaos who managed an overwhelming victory totalling an astounding 98k pts and 84k pts (66k adjusted for completion rate) respectively! So who will take the title this year? Remember: even a last minute hero may tip the balance! For the newcomers, if you want to get a flavour of what happened in the past you can have a look at previous ETLs here. …and for the veterans: welcome back! Here are some thoughts that will describe the spirit of the ETL – these are some high-level principles, which cannot directly translate to rules, and therefore I will not be policing them. It is left to the individual participant to abide by those principles and try to get the most out of the ETL experience! An important thing to remember is that this is an opportunity to develop your skills, asking and giving advice and generally improve your painting regardless of your skill level. What I mean is DO NOT COMPROMISE your skill – it’s better to do a smaller vow painted to the best of your ability than double the points with a sub-par job (according always to your own personal standards of which you are the only judge). A good example of that is basing. The fact that doing bases is not compulsory in the ETL is for the benefit of those who do not yet posses the skill of doing proper basing and I don’t want them to feel excluded – not in any way! If, however you do posses the skill and you will not consider the model complete unless you base it then it is expected that you do base it. I want people to look at their minis and proudly say: “look, I did this during the ETL” instead of “look what that stupid ETL made me do”…. We encourage quality over quantity if it comes down to that choice. The purpose of the ETL is also to give the opportunity to people to paint their minis how they like them, not necessarily according to GW doctrine. It’s about creativity and imagination. As such it is possible to see some unorthodox painting/modelling like Chaos Berserkers counting-as Blood Angels’ Death Company (because that Successor Chapter is on the verge of falling to Chaos) or loyalist-looking Chaos Marines since that army may represent a recently fallen Chapter – not yet adorned with all the Chaos icons. All these are totally welcome and well in the spirit of the event. However, if people are using the “count-as” to just paint totally unsuitable models (using Space Marines to represent Flamers of Tzeentch for example) it sort of works against the principle of the ETL that is about faction loyalty and hard choices. I’m not going to call it ETL-illegal (because where do you draw the line?) but it is left to the frater self-restraint to do the right thing. Painting green Blood Angels successors is fine, painting Dark Angels and “calling” them Blood Angels is not. Remember, you can always do it as an out-of-competition entry. Another element is how to price your units. Some points’ optimization is to be expected (especially by those who, like me, paint for the sake of it and don’t think much about table-top efficiency) but please avoid overdoing it. For example, painting a SW Wolf Guard terminator squad and claim there are five Battle Leaders in Terminator armour just to reap extra easy points is just not cool (thankfully this has never happened with the SWs – it’s just an example). But if on the other hand you really want to paint five Battle Leaders then of course it is cool. Just paint what you intended to paint anyway. Another point (that is actually part of the official rules) is that it is expected that you start work on your entries AFTER you submitted your vows and not before. Models can be assembled and primed but that’s it. If someone was not aware that the ETL was coming and he/she has applied a base colour on a few minis in a squad I’ll probably let it slide but generally speaking nothing should be entered if it is worked on at a level above primer. I have limited ability to police this (I do have some) but it is expected, and I’m stating the obvious here, that people will not cheat. If you’ve started work on something before the ETL then it is not a legitimate entry (unless it is presented as out-of-competition). Lastly the ETL is an opportunity to paint your army while having fun interacting with other frater within our community. There is an element of friendly competition – which is intended and welcome, and friendly banters are not only tolerated, they are expected. Having said that, this is still intended as light-hearted fun. Please keep that in mind in your exchanges and also that there may be a language barrier or people can be at a different wavelength. Make sure you use appropriate tone and don’t forget the smileys – they go a long way to give context. And remember: B&C rules ALWAYS take precedence (this will be policed by me and the entire Moderating team). Hope the above gives the frater an idea of what the ETL stands for and hopefully those who choose to participate will endorse the spirit as well as follow the rules that can be found in the next section. Participants should pick a single Faction to join for the duration of the event. Factions are the teams of the ETL and are either single Forums or several Forums grouped together. A participant cannot change Faction during the event. Once the decision is made, that’s it. In order to decide which Faction you want to join please see “Forums and Factions” section below. Each participant is called to make at least one and up to a maximum of five (5) vows pledging to paint legal units from the Codex or any other army list associated with his/her Faction of choice. Also each vow should not exceed the limit of 3,000 pts. For more details regarding the content of the vow, please see “Legal Entries” section below. A vow must be officially submitted in each Faction’s Strategium (see “Strategiums” section below) and will require at least two pictures: one “before” and one “after” (see Evidence of Progress in “Important Stuff” section below). IMPORTANT NOTE: It should be stressed that a participant is liable for all the vows he/she makes and failing one is failing all! So think carefully before stepping-up your commitment, if you fail on the second or any subsequent vow all previous vows are lost too and will count for nothing. IMPORTANT NOTE: YOU MUST START WORK ON YOUR VOW AFTER YOU HAVE OFFICIALLY SUBMITTED IT. That means that vows should be unpainted or primed or in very early stages of painting at the moment of vow submission. Also you can never make a new vow while the previous one is pending! IMPORTANT NOTE: A new vow should only be made once the previous one is completed and not before! VOWS CANNOT BE ALTERED ONCE SUBMITTED! Obviously participants may use other, more colourful, format for their vows but always make sure that the items in brackets above are clearly mentioned. Participants who successfully complete ALL their vows will be eligible to wear ETL’s ultimate Badge of Honour the glorious Custos Fidei, irrespective of size or number of vows or his/her Faction’s overall performance! This is the badge one earns for delivering on his/her promise. There will also be a number of other badges (collectively named the Badges of Excellence) to reward actions of individual bravery above and beyond the call of duty! For more details, please see “Awards” section below. The Faction that has the most points cumulatively will be the overall winner of the ETL and will be named Primus Inter Pares! Since last year we reward the commitment of the participants even more! As such we want the completion rate (points completed/points pledged) to become more relevant in determining the winner. That works as follows: After the total points of each faction are counted (net of penalties for those who failed to complete the second or a subsequent vow) the result will be modified by the Faction’s overall completion rate! In this particular example Faction B will win over Faction A despite having fewer completed points on a nominal basis because it showed higher level of commitment thus getting ahead on a modified basis! To put it simply, high completion rates are a significant element in determining the ETL Champions - not to be ignored by even the traditional ETL super-powers! As such the faction with the most completed modified points (as per relevant Codex or army list) at the end of the event will become Primus Inter Pares i.e. the ETL Champion! DEADLINE FOR ENTERING: June 15th , 2016 @ 17:00 GMT. Participation is declared by submitting your first vow. All participants MUST make their first vow by June 15th (17:00 GMT) the latest. People that have not submitted a vow by June 15th cannot participate in this year’s ETL unless as an out-of-competition entry. It goes without saying that the final deadline will be strictly observed, so make sure you get your final touches done before that to avoid disappointment. IMPORTANT NOTE: Please note that GMT does not change from winter to summer time. Also note that deadlines will be strictly observed and the only clock that counts is the B&C clock! The Factions are the teams of the ETL. 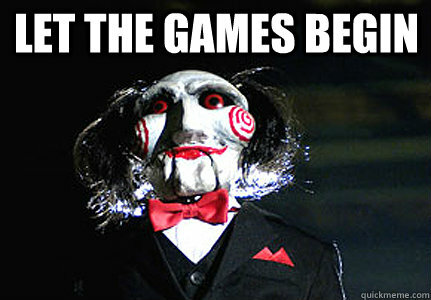 Each participant must choose a Faction and stay with it throughout the event. A participant cannot join more than one Faction and cannot change Factions during the event! The Factions of the ETL consist of either a single Forum or groups of Forums based around the official Codices (called the “defining” Codices). In some cases, this means that each B&C Forum that is associated with a Codex is a Faction in its own right. However, this could create imbalances given the uneven traffic between Forums. In order to make the event more balanced we grouped certain Forums together to form a single Faction as shown below. IMPORTANT NOTE: Codex: Imperial Knights can be used by ALL Factions! Yeap, you read correctly. Every faction (including Chaos) can use Imperial Knights if they so wish. Good luck with building and painting your Knights! IMPORTANT NOTE: Although Realm of Chaos is a multi-Forum Faction it has one Strategium – which means that participants who pledge for Chaos can use the Codices above interchangeably in their vows or indeed within the same vow. IMPORTANT NOTE: To preserve honour I will be recording the sub-forum of origination of each vow so we’ll see which Forum contributes the most in the IFOR effort. IMPORTANT NOTE: Like Realm of Chaos, IFOR is a multi-Forum Faction. Unlike Realm of Chaos, every Forum within the Faction has is own Strategium and as such participants must not only choose the IFOR Faction, they must also choose a Forum within the Faction and stick to it until the end. As such participants who pledge for IFOR cannot use the associated Codices interchangeably, they must use ones associated with their Forum of choice. In the origins of the ETL things were simple. Each faction had one Codex to work with and that was that. However, in this day and age, there are tons of official supplements, data slates and other add-ons that demand a deferent approach. Even standalone boxed games offer units compatible with 40k. IMPORTANT NOTE: Remember that you only have 5 vows and that each vow is limited to 3,000 pts maximum. Each vow should contain one or more legal units from your chosen Codex or associated army list. Units may be upgraded with any legal upgrades but WYSIWYG is required. Also note that upgrades that cannot be physically represented on the miniatures are not worth any points for the purposes of ETL. If in doubt of whether your vow is legal or not, feel free to raise the question (publicly or through PM) and you will receive my ruling before you commit (also see “FAQs” section below). The factions that take part in the ETL will still generally be defined by one (or more) official Codices as mentioned above. On top of that, ANY UNIT FROM AN OFFICIAL GW SUPPLEMENT THAT EXPLICITLY STATES IT CAN BE USED WITH THE AFOREMENTIONED CODEX IS ALLOWED! So, Campaign Supplements, Data Slates, White Dwarf exclusives, etc. are all allowed to be a part of one’s vow provided it is explicitly mentioned that the unit/item can be used in conjunction with the Codex that defines the faction. There is no restriction in using Apocalypse-only units. So go all out if you want, but keep in mind that WYSIWYG principle applies and the units pledged should to legal choices for the Codex/army list that defines the faction (should be explicitly mentioned either in the unit rules or the Codex/army list itself). Allies are NOT allowed in the ETL. This has little to do with technical issues and more to do with the feel of the event. ETL is supposed to pit Faction vs. Faction and Codex vs. Codex. Since Xenos are out of the question, allies will translate to a situation where participants may use their rival armies as allies, which feels totally wrong. So no allies – ETL is about making a hard choice and sticking to it until the bitter end! i) Forge World has produced the Second Edition of the first and second volumes of Imperial Armour (Imperial Guard and War Machines of the Adeptus Astartes respectively) as well as Imperial Armour 13 (Warmachines of the Lost and the Damned) and various Apocalypse supplements. These books cover all the issues with vehicles that participants may want to use along with their Codex force i.e. point values and compatibility with certain Codices. Relic vehicle rules means that, vehicles that would otherwise be reserved for the Horus Heresy setting can now be used in the 40k context and to support your preferred faction! ii) Using Forge World minis to represent alternative versions of standard Codex units is no problem at all. Feel free to use the DKoK to represent standard Astra Militarum if you want or the various Space Marine armour marks (even those designated “Legion”) with the standard Codex of choice. Straight forward, no? iii) For Forge World 40k army lists, things are a bit less straight forward – especially given that some armies integrate elements of various factions (as per ETL definitions). As such I have worked out a table where for each list presented in the Imperial Armour series is allocated to an ETL faction. The table is based on theme rather than play style or the actual miniatures used to represent said army – i.e. The Renegades of Vraks can be viewed as predominantly an Astra Militarum list which however is allocated to the Realm of Chaos faction. The various Special Characters are allowed but please take a look in the “Special Characters” paragraph of the “Important Stuff” section . Each faction will have its own dedicated ETL thread called the “Strategium”. The Strategiums are situated in all the relevant Forums and serve two purposes: The official and the unofficial. The official purpose of an ETL Strategium is for participants to submit their vows and for me to post the list of names of said participants, links to their vows, their points’ total and their status (complete or pending). I will also post links to the weekly updates that will help everybody monitor the overall progress of the event. The unofficial purpose is to serve as a place for participants to encourage each other, discuss developments, devise strategies and even for espionage! Experience showed that the more such threads are utilised, the more motivational they become! So choose the Faction you want to join, click on the link of the appropriate Strategium and submit your vow! Only two pictures are required for each vow – one in the beginning (minis unpainted or primed or in very early stages of painting) and one for the finished vow. You are of course welcome to post as many pictures as you like in your WIP thread (or your Strategium thread) – but just two (one at the start and one at the finish) will suffice! Please make sure that all the models of each vow get a “before” and “after” picture, either individually or as a group. ETL wants to encourage creativity so conversions are generally accepted. One has to keep in mind though that the conversion should be easily recognizable as the unit it is supposed to represent. Remember a level of WYSIWYG must be preserved. Following the above line of thinking and for the sake comparability, scratch-builds are not valid entries and are not allowed. Although some might be excellent representations of the GW originals others might be completely off and, with no intention of passing judgement on modelling ability or aesthetics, it’ll introduce an element of subjectivity that would be open to dispute. Such disputes we can do without and therefore we disallow scratch-build items altogether. See “Out-of-competition entries” later on. Special Characters are kind of a problem for ETL. They usually cost more than normal characters of similar stature due to their special rules or stats – both of which have no bearing in the ETL. However, such Characters exist in all factions so the effect is averaged out while the extra detail on the miniatures themselves ensures the effort to paint them is worth the premium. But what about Special Characters that do not have an official miniature out or what if participants want to make their own version of a Special Character that may already have an official miniature out? In that case we expect people to play in the spirit of the ETL and do the extra effort to present a miniature that will unmistakeably represent the Special Character in question. Kit-bash/convert the mini to the best of your ability not only with the correct loadout but with the extra attention that will make them stand out as true heroes of the faction. You also need to comply with the “irregularities” that certain Special Characters have. For example, a DIY Azrael is expected to have the Watcher (apart from a combi-plasma and a cool sword) and Redmaw must have both the Werewolf and the “normal” version… If in doubt, feel free to raise the issue with me before you commit. There could be cases that what people want to build/paint cannot be reconciled with the ETL rules. It’s just one of those things. For example, some might want to do crazy conversions or scratch builds; others might want to paint miniatures for other B&C compatible gaming systems (BFG, Epic, etc.) or some might miss the deadline for joining in. It’s also a possibility that new models are produced by either Games Workshop or Forgeworld that have yet to become official or legal for the purposes of this event or is some cases people might want to paint rival Factions’ miniatures. We would like to offer motivation for those who want to work on non-ETL compatible projects by allowing out-of-competition entries. These entries would be recorded in the progress tables, they can be freely shown on the ETL official threads and will be eligible to carry the Custos Fidei if they meet the deadline or carry the badge of the Oathbreaker if they fail. Out-of-competition entries are treated exactly like normal entries but no points will be awarded for them and therefore they would not contribute to any Faction’s total. But other than that we welcome all members of the community to join the party – no matter how crazy their project may be! Sometimes participants set self-imposed tasks or issue challenges to either other frater or entire other Factions. These challenges usually take the form of a self-inflicted penalty on the challenger if a condition set in the challenge is not met. For example, it may be something along the lines “if my Faction delivers fewer points to Faction X, I’ll paint a Faction X special character”. This special kind of vow is called “The Penance Vow”. These vows although welcome are totally unofficial and they have no bearing on the mechanics of the ETL. Furthermore, failing to uphold them has no impact whatsoever (i.e. I’m not going to police their completion). It’s entirely an honour thing. Those who complete ALL their vows successfully (irrespective their Faction’s performance) will be awarded the prestigious Custos Fidei declaring their success in ETL with the amount of completed vows clearly depicted on the badge! Those who vowed for the winning faction will additionally get the Primus Inter Pares banner and will be declared Champions for 2016! Winners can wear their honour badges with pride until the end of their days! Badge of [Faction] Champion: This badge is awarded to the participant with the most completed points within each faction – so each faction will have at least one champion, and in case of equal points, more than one! Badge of the Hero: This badge goes to participants who successfully completed all their pledged vows of which at least one was 3,000 pts. Badge of the Martyr: This badge goes to participants who successfully completed 15,000 pts (i.e. completed all 5 vows to the maximum allowance of 3,000 pts each). Badge of the Artificer: This badge goes to the entry that impressed us the most in terms of painting quality and modelling complexity. It is based on subjective criteria and can be claimed by out-of-competition entries as well. IMPORTANT NOTE: MANY FRATER ALREADY DISPLAY A NUMBER OF BADGES THAT MAKE FOR VERY LARGE SIGNATURES. BEFORE YOU ADD MORE MAKE SURE THAT YOU COMPLY WITH THE B&C SIGNATURE RULES. FOR OPTIMIZING THE SIGANTURE SPACE, WE WILL PROVIDE THE CUSTOS FIDEI ALSO IN MEDALLION FORM AS WE DID IN THE PREVIOUS YEARS. Feel free to contact me for any clarifications. So this is it! Keep in mind that whatever you do the B&C rules must always, ALWAYS be observed and the Moderators stand ready, meltas at hand! These are the FAQs based on previous years’ experiences and of what else I could think of at this point. However, it is possible (inevitable?) that new issues may arise that would require a ruling. In that case, once I make a ruling I’ll add it here so all participants can be updated simultaneously. So before you ask a question check back here first – it might be already answered. Q: Can Characters who are squad upgrades for units become legal entries in their own right? A: Yes, they can. However, they are only worth the “upgrade” points i.e. do not add the points of the miniature they replace when used in a squad. This of course is waived if you do paint an entire squad with the special Character upgrade in which case normal rules apply! Q: Are dedicated transports legal entries in their own right? A: Yes, they can be entered as standalone entries for the points mentioned in the relevant section of the Codex. Q: How far do we go with WYSIWYG? A: As much as you can. Equipment that goes at the basic price of the mini is not really required (but they are most welcome - I love those frag grenades) but everything from the options list MUST be represented in order to count. Q: What about allies? 40k rules now allow them. A: But not ETL rules... This event is about faction loyalty and Codex “patriotism” and sticking with your faction to the bitter end. In other words, if it’s not in the Codex (or other legitimate army list), it’s not ETL-legal. Q: Can I vow alternative load-outs and earn the extra points for them? A: No. You must pledge a particular configuration – so choose carefully. There is no benefit from magnetizing, not gluing or blue-tacking alternative bits on the mini. Q: Can my second vow be an expansion of my first vow? For example if I vowed and completed a 5-strong tactical squad can I then vow for another 3 to bring it to a total of 8? A: No. Each entry should be a standalone legal unit from the list of your choice. No add-ons on previous vows. Q: I made my first vow for Salamanders (Codex Faction). Can I change to Iron Hands (also Codex Faction) for my subsequent vows while staying within the Codex Faction? A: Yes! Just make sure you still use Codex: Space Marines to price your units. You can change sub-forum/Chapter but you have to stay true to your Faction (Codex) until the end of the event. You may even pledge different Chapters in the same vow! Pledging for different Chapters does not affect the ETL mechanics as they are all Codex after all. Q: I pledge for Chaos. Can I use units form all associated Codices and FW lists? And can I do it in the same vow? A: Yes! Chaos has a single Strategium and as such any unit from any associated list is ETL-legal. Even within the same vow! Q: I pledge for IFOR. Can I use units form all associated Codices and FW lists? And can I do it in the same vow? A: No! IFOR has a five Strategiums and each one has its own associated Codices and army lists. So here you must not only choose to vow for the IFOR Faction but also for the specific Forum within that Faction. As such you can only pledge units that appear in that Forum’s associated Codex and other army lists. Q: Why a limit of only 5 vows? A: I believe 5 vows to be adequate to capture the zeal as well as to deliver the points that the participants plan to complete. Also (and this is important) the limit of 5 vows creates an additional strategic consideration. Participants need to think ahead, discuss with each other, review their stash of miniatures and decide on their commitment when the time comes. I think this adds another dimension to the ETL! Q: Why a limit of only 3,000pts per vow? Past experience has shown that the average vow of the ETL is in the order of ca. 600pts. However, there were cases where the points’ value of a vow diverges significantly from the average and we had cases where people were vowing in excess of 5k pts per vow and in some cases more than 10k pts(!) with the record being more than 17k pts in a single vow!!! Although the ETL cannot be won by any frater singlehandedly, the painting daemons amongst us can influence the performance of a given Faction disproportionally. As such the Inner Circle decrees that there will be a limit imposed on each individual vow of 3,000 points! We believe 3,000pt per vow and a total possible of 15,000 pts to be more than adequate to sate the thirst of the painting daemons among us while retaining the focus on the mass participation and teamwork. Q: What happens if an updated Codex or other army list becomes available during the ETL? Do we price our units on the previous Codex or take on the new one? Well if this happens, participants will make their future vows based on the new Codex/army list. Their existing vows however will retain the pricing of the old Codex – go back and re-price the entire Faction is logistically impossible. The same applies for units that may have been dropped out of the Codex (not very likely but possible in principle). If you have vowed for a unit that existed in the Codex at the time of the vow you will i) need to see it through even if it has not tabletop function anymore and ii) it will still worth its points of the old Codex even if the new Codex does not include it anymore. Q: Got a “count-as” from another manufacturer (not GW/FW). It’s roughly the same size – can I enter it? Q: Why introducing the completion rate to determine the Primus Inter Pares? A number of reasons played into taking this decision. Firstly, I wanted to give an extra boost to the Factions that have lower traffic but display a great enthusiasm for the ETL yet are unable to threaten the top positions. Well now they will have an extra incentive. Staying true to the cause and deliver high completion rates will have a tangible result as well as the honour that carried the previous years. Secondly it is designed to increase the motivation of actually completing the vows. It means that participants will be incentivised to pledge more manageable vows to begin with and those who overextend themselves will feel the added pressure to deliver as in case of failure they will not only be depriving their Faction of their pledged points for this and any previous vows they might have completed; they would also be penalising the chances to win by lowering the Faction’s overall completion rate. So you feel like vowing a huge amount? You’d better be confident you’d deliver! Q: But what if real life intervenes and I fail to complete due to no fault of my own? Everybody will hate me! Nonsense. Real life happens to all and always takes priority! Furthermore, this is the B&C – no one will hate anyone on the basis of something happening in his/her life that prevents him/her from painting little plastic miniatures. It’s called reality check! Edited by Captain Semper, 14 May 2016 - 03:23 PM. Its not the 15th yet Captain Semper! "Borg to the Max!" "Destroy All Flesh!" Yeah? Well this is all The Shadow Guard's sheer genius! Oh, I got this footage from the Inquisition. You would not believe some of the stuff in their records. Could I clarify a couple of things. The FW army lists is missing Imperial Armour Aeronautica. Does that mean that I can't vow an Avenger for my Sisters? Also - Cypher. Can I vow a Canoness with his load out as long as she is painted appropriately? There is no mention of him in the first post (that I can see - I might have missed it ). Once again - thank you for running this and to The Shadow Guard for the badges etc. Long may this B+C tradition remain! Edited by Aquilanus, 14 May 2016 - 09:02 PM. ON TO A CHAOTIC ETL HAT TRICK!!!! That said - SISTERS! March to Battle! Could I clarify a couple of things. The FW army lists is missing Imperial Armour Aeronautica. Does that mean that I can't vow an Avenger for my Sisters? Also - Cypher. Can I vow a Canoness with his load out as long as he is painted appropriately? There is no mention of him in the first post (that I can see - I might have missed it ).Once again - thank you for running this and to The Shadow Guard for the badges etc. Long may this B+C tradition remain! The Avenger is a definite yes! Go ahead and use it! As regards the Canoness become Cypher, wait for it, it's also a yes! "Look to the skies, Sisters. Retribution is inbound!" ^^ That Canoness-as-Cypher idea is actually very cool!! I´ll look for it on the IFOR strategium. Good luck to all and may the best win. FOR CHAOS!!!!! It's a pity that my LotD Sisters aren't valid (I do understand totally why though and they're being entered as a regular BSS instead), but yeah, look out for her! You heard the Captain gents, TALLY-HO! My body is ready, the spirit willing! Quick question - I want to pledge my Space Hulk terminators, but they don't break down into any kind of a valid unit entry (thanks two random assault guys )... Do I just break them down into three squads and fill in the gaps with more termies?